Hello garden gals and guys! I'm feelin' peachy keen today. The Georgia Peach truck made another stop through Maryland! I got another box of that juicy sweet goodness to preserve for the winter. Okay, I confess. I hate canning. It's not the work, it's the heat. The kitchen becomes hotter than hell's pepper patch when the canner is going. I'm not interested in it being hotter in my home than it is outdoors. Ain't nobody got time for that! This garden diva chose to use her foodsaver instead. Come on in the kitchen and I'll show you how it works. Ah, I'm glad you asked. 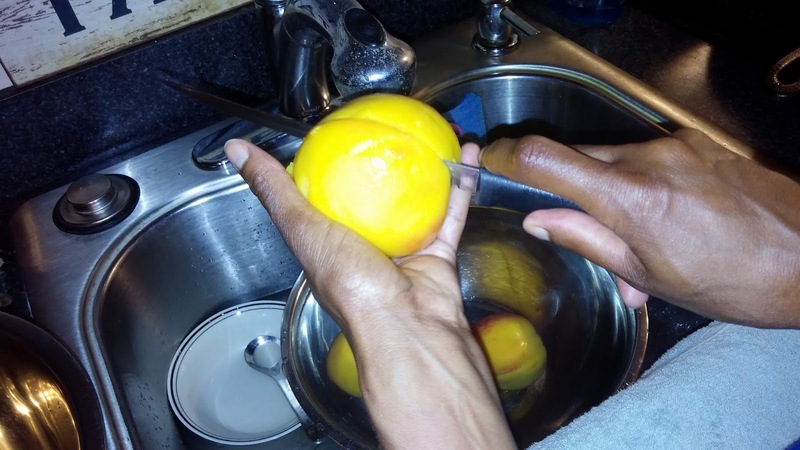 Blanching is a cooking process where your fruits (or vegetables) are scalded in boiling water for a brief period and then put into ice water to stop the cooking process. It has a lot of benefits, but in my case I do it to make the skin easy to peel off. Take a sharp knife and cut an 'x' on the bottoms of the peaches. It doesn't have be deep, just enough to pierce the skin. This will make it easy to peel the skin off later. Next, heat a pot of water to boiling on the stove and prepar a large bowl of ice water. 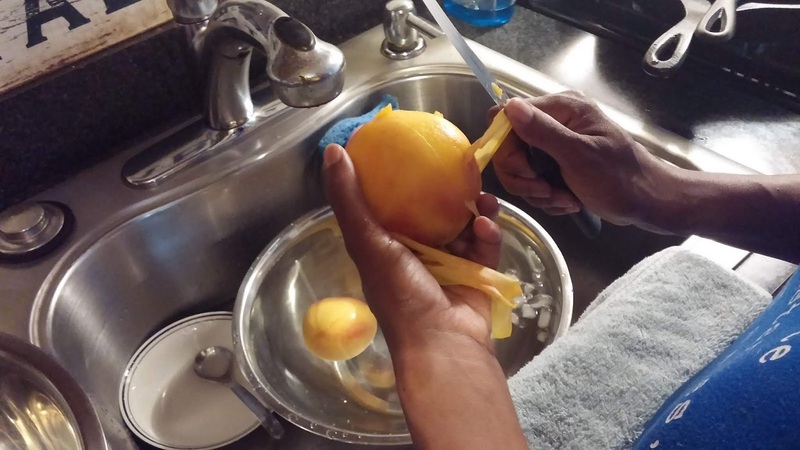 Once the water is boiling, place a few peaches at a time into the water. Boil for one minute only. 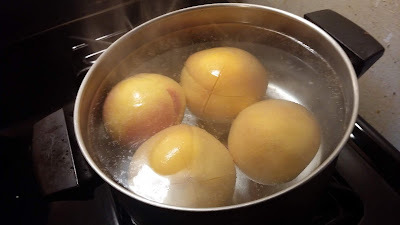 After one minute, remove the peaches with a large spoon or a ladle and place them in the ice water for one minute, then remove. This stops the cooking process. Use your knife and peel the skin off where you made the cuts. It will come off easily. Once the skin is removed, you will see a line in the peaches. Cut down into that line and continue all the way around the peach. 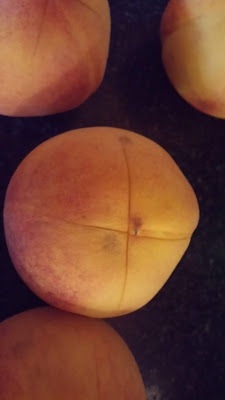 If you don't see a line, cut around the center of the peach lengthwise. 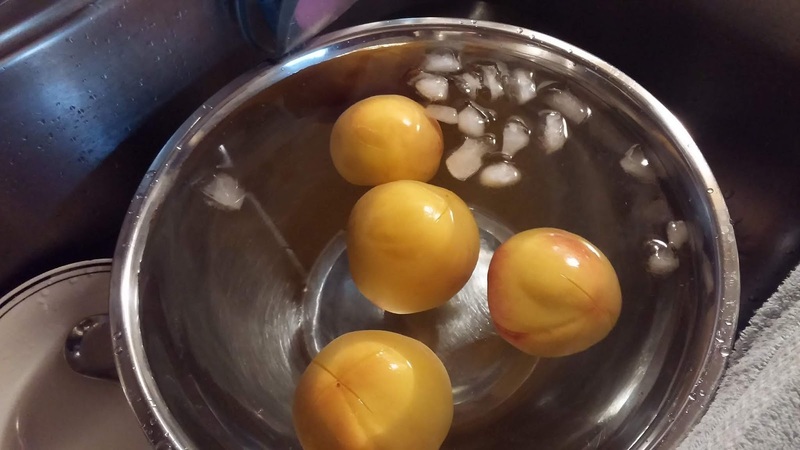 Remove the pit and place the peach halves in a bowl. That's it! Easy, right? You may be asking about saving the pits. Yes, you can! I saved pits from the last batch I bought so I didn't save any this time. 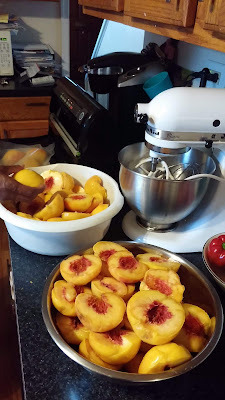 As I mentioned earlier, I don't like canning, The method I used to preserve my peaches is foodsavering. I love my foodsaver. I've had it for quite a few years now. It's a bit of an investment up front, but worth it. It pulls all the air out of the bag and seals it, ensuring that your food doesn't get freezer burned. So here are my peaches ready to be preserved. Five large and one small bag of peaches! Next stop: the freezer. The whole process took an hour from start to finish. 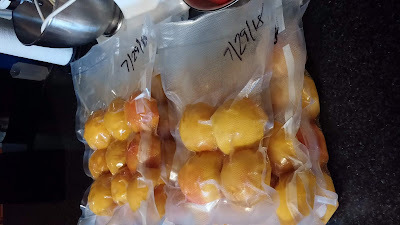 Along with the peaches I froze from the last box I bought, fresh peaches in the winter months won't be a problem. Now that's winning. Two more things before I go. Here's my little harvest of tomatoes, mini bell peppers, cucumbers, and eggs from my girls. You may remember my oldest son's love for pickles. If so, you know the fate of those cukes. I wish my peppers looked that good. Those are beautiful!!! 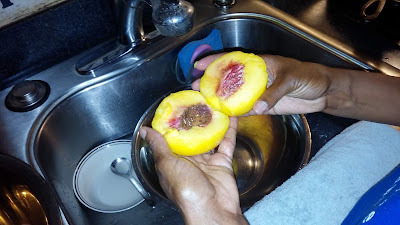 Yum on the peaches!! 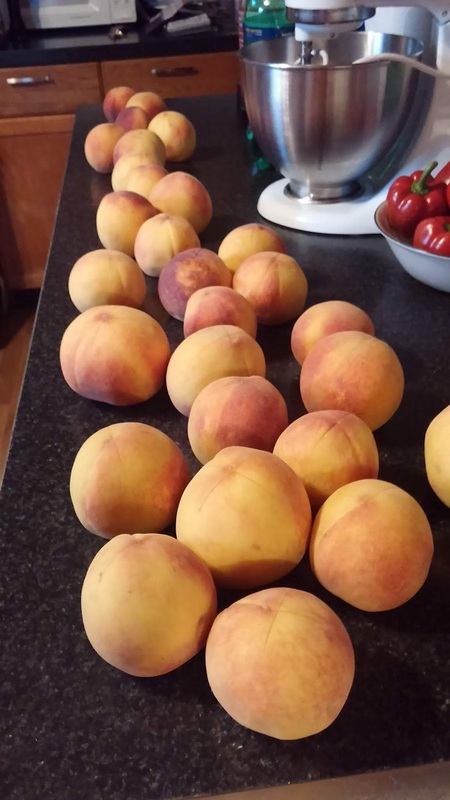 We love peaches here in Georgia. Hi, Nana Kay! Thank you for stopping by! Those peppers are mini bells and it's my first time growing them. I think they will be a regular in my garden from now on. I can see why you love peaches there in Georgia. They are so sweet and juicy! 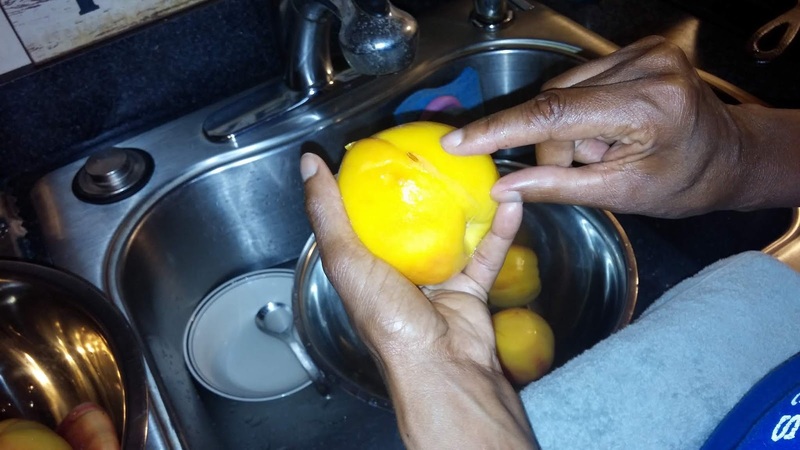 Remind me of my grandaddy's peaches when I was a kid! That peach truck is from a farm in Georgia just outside Macon, which is where my paternal grandma is from! 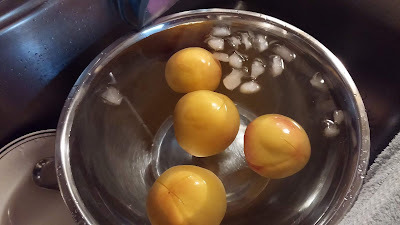 Say, do you have any good peach recipes you'd care to share? Everything looks beautiful. Peaches are a huge job, but oh, so worth it. 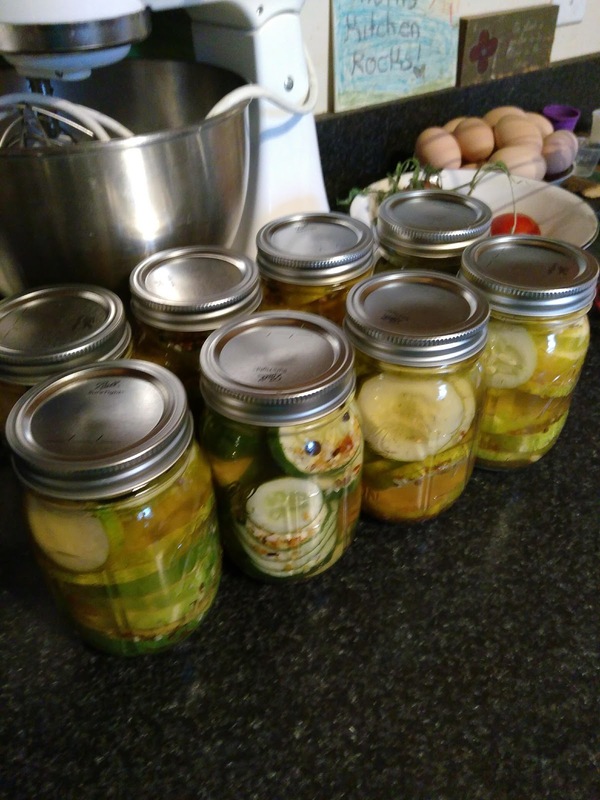 I do my canning on the back porch! Your harvest looks wonderful too. Such lovely colors.